First day of issue ceremony programs for new postal releases provide an intriguing and fascinating collecting theme. As the American Ceremony Program Society’s website notes, “Not only do the programs distributed at many of these events become collectible souvenirs, they also function as tangible documents of postal releases and thus serve as historical records”. (http://stampceremony.org/). 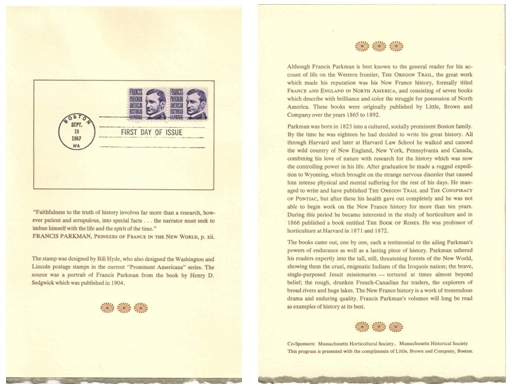 Unique and appealing items created and distributed in conjunction with the launch and promotion of new postal releases, as well as philatelic items associated with the stamp’s designer, undoubtedly enhance ceremony program collecting. Such is the case with the September 16, 1967 ceremony commemorating the release of the Prominent American series 3-cent Francis Parkman issue, Scott #1281. Conducted in the Horticultural Hall of Boston, Massachusetts, the Honorable Ephraim Martin, Postmaster, Boston Postal District, presided over the ceremony honoring Parkman (born September 16, 1823, died November 8, 1893) as one of the foremost historians of his time. A highlight of the first day ceremony was an address entitled The Life and Works of Francis Parkman, given by Colonel Edward P. Hamilton, Director, Fort Ticonderoga Museum. Colonel Hamilton described Parkman as a highly skilled naturalist and an experienced European traveler. Parkman is best known as author of The Oregon Trail: Sketches of Prairie and Rocky-Mountain Life and his monumental seven-volume France and England in North America. Parkman was also briefly a Professor of Horticulture at Harvard University and author of several books on the topic. 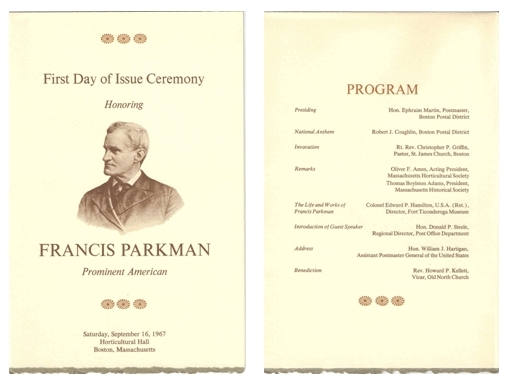 Secondly, page 3 of the ceremony program acknowledges Bill Hyde as the designer of the Parkman stamp, basing his design on a portrait in a biography of Parkman by H.D. Sedgwick. Hyde also designed the four-cent Lincoln (Scott #1282) and the five-cent Washington (Scott #1283) issues of the Prominent American series. 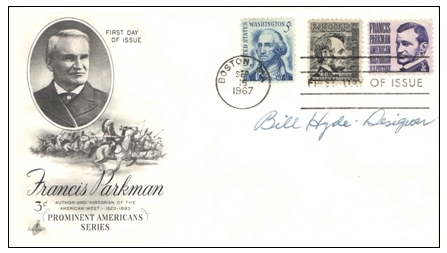 The first day cover shown here (with a September 16, 1967 postmark for the Parkman issue) is franked with the three Prominent American series issues and is autographed by Bill Hyde as the Designer of the stamps. In and of itself, I think this is an exceptionally appealing item associated with the Parkman first day ceremony. But more so, note the design of the five-cent Washington stamp affixed to the cover. Philatelists have called this the “bearded” Washington. 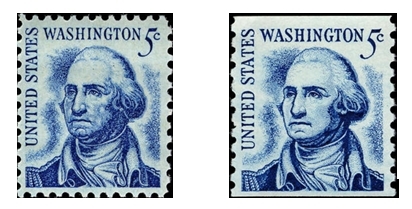 Hyde designed the stamp after a painting by Rembrandt Peale located in the National Gallery of Art. But the public objected that the heavy shading around the lower part of the face made Washington’s image look unshaven and pockmarked. A flawed design or a botched engraving? 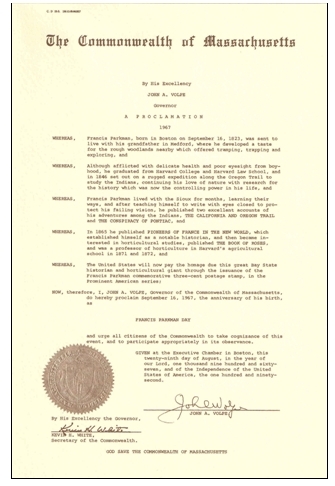 Regardless of the reason, a smoother-looking version was issued on November 17, 1967. Rarely, if ever, has the public so vehemently objected to a stamp’s design and forced a re-issuance. Needless to say, I do not have in my collection a cover franked with the re-issued five-cent Washington and autographed by Bill Hyde! So expand and enhance your ceremony program collecting by identifying and acquiring appealing items that are associated with new postal releases. The three-cent Parkman issue is an excellent example of this opportunity.